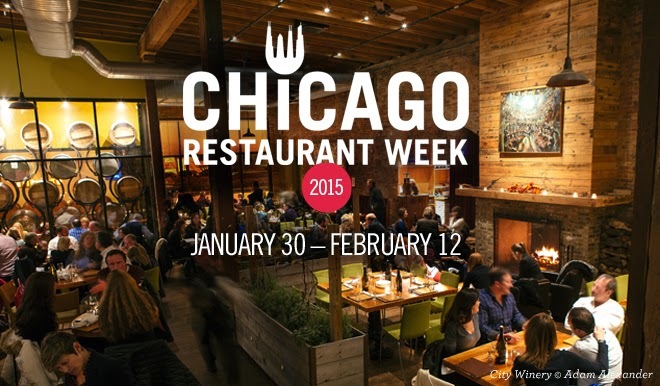 Chicago's 8th Annual Restaurant Week, produced by Choose Chicago, began on Friday. It isn’t too late to get a great reservation at eatitupchicago.com. New to the Chicago Restaurant Week lineup this year are Acanto, Bottlefork, Fig & Olive, Gibson's Bar and Steakhouse, LuxBar, Mariano's, Moto, Parrot Cage Restaurant, Porkchop (Hyde Park), RM Champagne Salon, The Duck Inn, to highlight a few. This year marks the first time foodies can experience CRW at O'Hare InternAirport. If you're traveling, be sure to stop by Wicker Park Sushi (Terminal 2), Stefani's Tuscany Café (Terminal 1) or Goose Island Brewery (Terminal 3). Five Mariano's locations, including Bucktown, Lakeshore East, Ravenswood, South Loop and West Loop will offer a variety of ‘Lunch for 2' options at these participating locations. The 14-day promotion continues through Thursday, February 12 and is packed with delicious prix fixe menus starting at $22 for lunch and $33 and/or $44 for dinner (excluding beverages, tax and gratuity). Dynamic offerings from more than 250 restaurants throughout the Chicago area, including 33 new participating restaurants are now available online at eatitupchicago.com. Have you tried Maxwell’s at the Club (500 N. Kingsbury, 312-527-5800)? This hidden gem is located inside the East Bank Club and offers live music nightly in its bar on Tuesdays through Fridays. Here’s your chance to experience it and enjoy their Chicago Restaurant Week deal. For a complete list of participating restaurants and to find listings via neighborhood, visit www.eatitupchicago.com. Be sure to make reservations early, and check back often as restaurants and menus will be added daily. Stay up to date with menus and new restaurant additions to the Chicago Restaurant Week lineup: follow @ChooseChicago on Twitter and Instagram, LIKE us on Facebook, and get social using #CRW.